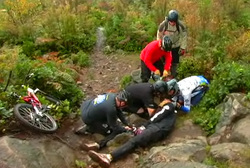 First Aid being given to a mountain biker. First aid is the life saving, critical help given to an injured or a sick person before professional medical aid arrives. First aiders are never required to place themselves in a situation which might put them in danger. Remember, you cannot help a victim if you become a victim yourself. This section is not a replacement for competent training. Nor is it a replacement for calling 911 in the event of an emergency. I'm including this section merely to inform you of what you should think about, and prepare for. Depending on where you live, your chances of being the first person on an incident scene can be very high. The saying, "When seconds matter, Help is only minutes away," is true over most of Arizona. Here in Pinal County, the Medivac helicopter can get to you faster than most ground units. As part of your Emergency Preparedness program, you should take a basic First Aid course, along with a CPR class. If anything, getting some basic training will at least tell you what you should NOT do to someone who's injured. Here are links to a couple of agencies who provide First Aid and CPR training in Arizona.